Unfold the pastry sheet on a lightly floured surface. Roll the pastry sheet into a 16x12-inch rectangle. 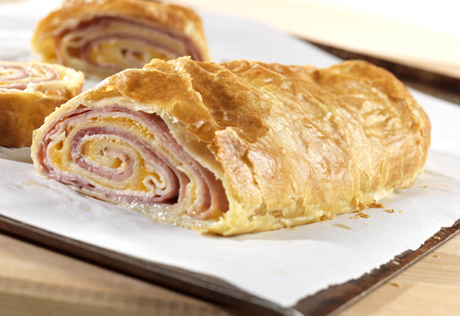 With the short side facing you, layer the ham and turkey on the bottom half of the pastry to within 1 inch of the edge. Sprinkle with the cheese. Starting at the short side, roll up like a jelly roll. Place seam-side down onto a baking sheet. Tuck the ends under to seal. Brush with the egg mixture. Bake for 25 minutes or until the stromboli is golden brown. Remove the stromboli from the baking sheet and let cool on a wire rack for 10 minutes.